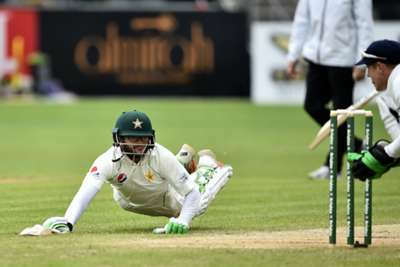 Ireland's historic Test debut ended in a five-wicket defeat, but only after they had given Pakistan a major scare on the final day at Malahide. The tourists ultimately prevailed with a degree of comfort, reaching a target of 160 thanks largely to Imam-ul-Haq's unbeaten 74 and 59 from Babar Azam. However, Pakistan had crumbled to 14-3 in Tuesday's morning session, raising the prospect of a stunning Ireland victory after the hosts had been made to follow on. Mohammad Abbas finished with a five-for and match figures of 9-110 as Ireland were dismissed for 339 having resumed on 319-7, the dangerous Kevin O'Brien failing to add to his overnight score of 118. O'Brien's hundred, which will go down in the history books as his country's first in this format, kept Ireland alive on day four, but he departed to the first ball he faced on Tuesday, edging Abbas to Haris Sohail at slip. Abbas swiftly removed Boyd Rankin (6) and Tyrone Kane (14) to return second-innings figures of 5-66. Ireland fought back superbly, though, taking three quick wickets to bring the contest to life. Tim Murtagh had Azhar Ali (2) caught at first slip and bowled Asad Shafiq (1), either side of Sohail (7) departing to an excellent Ed Joyce catch in the gully off Rankin. However, debutant Imam and Babar maintained their composure to combine for 38 runs before lunch and their alliance continued well into the afternoon after the latter was dropped by Andrew Balbirnie off Murtagh on nine.